The Inland Marine Underwriters Association [IMUA] is a not-for-profit association focused on the commercial inland marine insurance line of business. IMUA was organized in 1930 as a national trade association and rating bureau for all inland marine classes. In 1948 the rating bureau activities of the IMUA were transferred to the Inland Marine Insurance Bureau (now defunct) due to the 1944 US Supreme Court decision in the South-Eastern Underwriters Association case. Members - insurance and reinsurance companies that underwrite a significant portion of the commercial inland marine insurance in the U.S. Associate Members - companies or organizations that provide products and/or services to the insurance industry. IMUA is committed to advancing the educational, governmental, regulatory and technical interests of the commercial inland marine insurance industry. One of the services IMUA provides its members is the publishing of information for use by underwriters, loss control and claims specialists, and other interested parties. The topics covered by IMUA Reports, Bulletins and News Articles are intended to provide an overall awareness of the issues, hazards and exposures associated with a specific industry or inland marine class of business. Volunteer members of a technical committee of the IMUA or IMUA staff have produced this information. Committee members abide by antitrust restrictions while compiling information. It is generally not possible to treat any one subject in an exhaustive manner, nor is it IMUA’s intent to do so. No warranties are made regarding the thoroughness or accuracy of the report or any part of it. Nothing in this report should be interpreted as providing definitive guidance on any question relating to policy interpretation, underwriting practice, or any other issues in insurance coverage. IMUA does not prescribe to its members how to make underwriting or claims decisions, nor does it require that analysis follow any particular format. American Security & Protective Services, Inc.
for his assistance in reviewing this report. NOTE: This is an October 2010 update of the report previously issued in August 2009. A pallet is a portable platform that facilitates the movement and storage of unitized goods. Stacking goods on pallets with lift trucks emerged as a handling technique by the United States military during World War II. The pallet’s popularity and use spread rapidly after the war and today the pallet is a fundamental component of most modern materials handling systems. There are about 450 million new pallets produced each year in North America and nearly 2 billion pallets worldwide are in use at any given time. An estimated 90 percent, of pallets are made of wood held together by metal fasteners - either staples or nails. Wood is the preferred material since it is readily available in most places and is generally the most economical choice. The initial cost of a typical wooden pallet is approximately $9 - $20. Wood pallets require frequent repair or replacement, on average every 5 trips. It is estimated that maintenance costs can run as high as $6 per month per pallet. Wood pallets are relatively easy to assemble and wood is more adaptable to the various pallet designs used by industry. However, wood normally contains a high percentage of moisture that under certain climatic conditions can be released and affect the packaging of the goods and the goods themselves. Pallets also have metal fasteners that can damage goods and are prone to splintering which can result in failure during handling or storage and damage to products. Many different types of wood are used in the fabrication of pallets but generally it is convenient to categorize the wood as either hardwood or softwood. There are some significant differences within these broad groupings and ultimately one must consider the actual strength and related cost of each of the species. Wooden pallets come in two basic designs: stringer or block. Both types have a top deck of boards on which the load rests; the difference is in the frame that supports the deck. Stringer pallets use a frame of two or more boards (stringers) that run the length of the pallet and perpendicular to the deck boards. Most of the stringer pallets contain three stringers, one along each side and another down the middle. Stringer pallets are two-way pallets meaning that fork trucks can enter in their two opposite ends; however, some stringer pallets have notched sides that allow forklift access from any direction (four-way) which makes them more versatile. Block pallets have a frame comprised of three stringer boards supported by solid blocks of wood. Most of these pallets have nine blocks - one at each corner and midway at the side as well as another row in the center of the pallet. Most block pallets are true four-way design. Both stringer and block pallet types have a series of bottom boards underneath the frame Note: a pallet without bottom boards is technically a skid although both terms are commonly used interchangeably. Pallets with the same number of top and bottom boards are called reversible pallets since they can be used with either side up. The most common alternative pallet materials are (in order of pallet quantities) plastic, paperboard, metal and specialized wood. Molding techniques also differ. Generally, plastic pallets are lighter (as much as 37% lighter) and more durable than their wooden counterparts. They are far more uniform in size and shape. 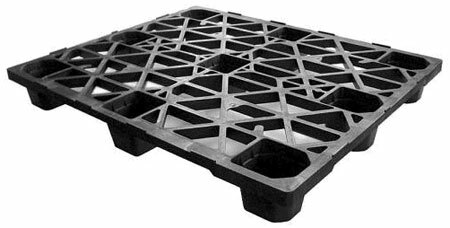 Plastic pallets are considered far more sanitary since they generally do not absorb moisture or other product contaminants. They are the pallet of choice for consumable goods like food and beverages. However, since they are generally hollow, they do have the potential to be punctured and can carry infestation or water in the punctured areas. Further, unlike wood, when used to transport goods internationally, plastic pallets are not required to meet the phytosanitary requirements. Wood pallets need to be heat-treated, fumigated with methyl bromide or other approved chemicals, or chemical pressure impregnated (CPI) to ensure that no disease-carrying pests are living in the wood and be so marked. International Standards for Phytosanitary Measures (www.ippc.int), ISPM 15 entitled "Guidelines for Regulating Wood Packaging Materials in International Trade." 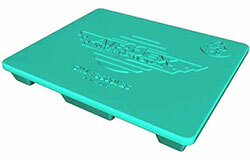 The major disadvantages of plastic pallets are their expense (as high as $75 per unit), especially if a custom mold is needed for unique dimensions; the increased fire load they can create in a covered storage location; and their need to have fire retardants included if they are to pass Underwriters Laboratory L 2335 or Factory Mutual 4996 standards. Many of these fire retardants can leach out of the plastic and attach themselves to the product, and can be considered to be toxic. They also have low stiffness plus plastic pallets lack viable repair options. The plastic pallet surface may be slick with the potential for product slippage and damage. To mitigate this, the pallet manufacturer may add sand during fabrication or place non-skid strips on the load-bearing surface. Composite materials, a mixture of wood fibers and plastic, can be used to build pallets that look like plastic or wood, and plastic can be combined and extruded into pallet boards that can appear much like a wooden pallet. Composite pallets are strong and uniformly shaped so they work well with automated material handling and storage systems. However, they are expensive to build and are typically limited to captive or closed-loop environments where the pallet owner maintains control of the unit. Also, some composite pallets are made by binding together wood particles with adhesive resins which are made from plastic and per National Fire Protection Association [NFPA] 13 (the code that defines requirements for sprinkler systems). A pallet having any portion of its construction consisting of a plastic material is considered a plastic pallet in the industry. Corrugated pallets (honeycomb, solid fiberboards and molded pulp) are becoming more popular due to the fact that they are lightweight; do not have to meet the phytosanitary regulations; and can be easy to recycle. On the downside, they are susceptible to moisture; lack stiffness and durability; offer lower product protection; and most are not strong enough to hold heavy loads. They are also more expensive to build than a solid wood pallet. Metal pallets are usually constructed of aluminum and steel. Aluminum pallets are lighter, but cost more. Metals pallets, regardless of the material, are more expensive than wood; however, they are inherently stronger; ideal for exceptionally heavy loads; durable; uniform in configuration; and more sanitary. For these reasons they are often used in clean room and high temperature environments where other pallets would be likely to burn or melt. The one downside of metal pallets is that when they are damaged, the edges can be quite sharp, presenting a personnel hazard. Until 2002 the world of pallets was generally limited to the previously mentioned materials of construction. New pallets technologies are constantly evolving, including lightweight, high load strength foam core pallets. An example of the new technology - the "AIRDEX" pallet - was introduced to the market utilizing a molded EPS (expanded polystyrene) foam core with HIPS (high impact polystyrene) full jacket skin which offered a totally new standard in Strength to Weight engineering. The new AIRpallet weighs in at less than seven pounds yet can carry weight in excess of 1500 pounds and handle a static weight capacity exceeding three tons. Today, these pallets come in several models ranging from six to twenty pounds, with variable load capacities up to eight tons and rack-able to three tons. Today this technology reduces overall cargo weight and thereby cuts shipping costs. New radio frequency technologies are becoming commonplace in cargo tracking systems. For logistics management, the problem of signal attenuation in pallets with metal or dense fixtures becomes a concern. The increased use of Radio Frequency Identification [RFID] favors pallets in so far as RFID tags can be embedded into the pallet structure. RF tracking devices can actually be molded into the center core of the AIRDEX style pallet and become invisible to the user. This "stealth" feature is very beneficial to anyone seeking protection from and detection of theft practices common in the pallet shipping world. Thermal Insulation is inherent in the entire pallet structure, thereby protecting temperature-sensitive cargo from temperature migration through the bottom of the pallet. Shock Absorbency is inherent in the entire pallet structure as it is virtually made of air (foam core) which is the common constituent of most cushioning material used in protective packaging applications. Waterproof HIPS full-jacket coating provides total moisture protection and keeps the pallet from gaining water-weight from humidity or rain exposure common to wood pallets. Tamper Evident construction is afforded by the solid core construction that will not allow the typical "cut and replace" theft practice commonly used in pilfering cargo from the underside of wood pallets. Repair and Recycling is a common problem for almost any pallet type except wood. However, the AIRDEX-type pallet can be easily repaired and when damaged beyond repair, can be recycled by common plastic grinding systems. The AIRDEX pallet can be fitted with a U. S. BioSensors Inc. GPS/AGPS tracking device capable of real-time reporting of: GPS position, Temperature, Shock, Vibration, Ambient Light and Sound levels. It can communicate with nearly all modes of RF communications so it is never out of touch. It is capable of reading any RFID tagged cargo items which are loaded on the pallet as well as peer-to-peer communications with other AIRDEX pallets within its proximity. Information is available through www.airdex.com or www.usbiosensors.com. Until now, bar-coded and RFID scanning devices had been the primary options for tracking individual pallet shipments. In September 2010 American Security Logistics [ASL] and AT&T announced the availability of a wirelessly connected tracking device that will track the location and ongoing movement of cargo pallet shipments by utilizing AT&T’s wireless network. Principally designed for high-value cargo shipments, the VISI-pallet tracking device collects and stores data even when out of GPS signal range. Geo-fence parameters can be established and set to ‘alarm mode’ if the shipment moves outside a predefined geographic area. Along with enterprise benefits, the ‘connected’ pallets help address safety concerns within the food and pharmaceutical markets where traceability is so critical. One potential disadvantage that needs exploration relates to fire protection. Stacks of any pallets, particularly exposed foam (Group A) pallets, pose a significant high challenge fire scenario to sprinkler systems that must be considered in the sprinkler system design. There are a number of factors a shipper or storage site operator faces when selecting a pallet. Strength - the load-carrying capacity throughout the shipping and storage environment. Stiffness - resistance to deformation under load during normal handling, storage and/or transportation. Durability - the ability of the pallet to withstand the anticipated rigors of handling and transportation; the importance of this characteristic can be minimized if the pallet will simply be used once then discarded. Functionality - the compatibility between the pallet and the packaging and material handling equipment. Cost - refers to not only the purchase price but other attendant expenses associated with maintenance, repair and recycling. There are trade-offs when deciding whether to use wooden or plastic pallets. The selection can be based on several issues such as cost; industry practice; the nature of the product shipped; weight of shipments; one’s pallet management system; environmental impact and existing fire codes. Flames from wooden pallets are almost entirely confined to the height of the stack and are seldom higher than 3 feet while those from plastic pallets far exceeded the stack heights and can reach in excess of 20 feet. Plastic pallets are easily ignited by a match whereas wooden pallets required a far more energetic fuel source. NFPA provides a detailed breakdown of sprinkler requirements for idle and commodity pallet storage. It is recommended one review their standards to determine specific requirements. Idle (i.e., not being used) wood or plastic pallet storage should ideally be outdoors, preferably 30 feet detached from any combustible building, or 15 feet from non-combustible buildings. Storage in a low valued, detached building is also acceptable. In many jurisdictions, local building or zoning codes may prohibit exterior storage of pallets due to aesthetic reasons. If allowed, the outdoor storage area should be fenced/lighted to reduce the potential of vandalism/arson as idle pallets are an attractive nuisance. Certain industries, such as the food industry, generally utilize plastic pallets exclusively due to their resistance to infestation. Indoor storage of idle pallets poses a significant challenge fire scenario to successful sprinkler control, due the geometry of the pallet, air voids, and the surface areas available to burn. Storage of idle wood pallets directly on the floor is common in industry and warehouses, while storage in racks is less common but poses a greater fire challenge to successful sprinkler system control. Storage configurations different than the above 6 feet height rule may be possible, but will depend upon the sprinkler system design. Consult NFPA 13, "Installation of Sprinkler Systems", or Factory Mutual Data Sheet 8-24, "Idle Pallet Storage" for specific details and specifications. For example, technology now exists to protect 35’ high pallet storage in a 40 feet high building, but that requires specialized sprinkler protection/design. Bottom Deck: Assembly of deck boards comprising the lower, load-bearing surface of the pallet. Captive Pallet: A pallet intended for use within the confines of a single facility, such as a factory, not intended to be exchanged. Chamfered Deck Boards: Deck boards with edges of one or two faces beveled either along the full or specified length of board or between the stringers of blocks allowing easier entry of pallet jack wheels. Closed Distribution Systems: Shipping system restricted to moving goods within or between specified plants and facilities. Deck: One or more boards or panels comprising the top or bottom surface of the pallet. Deck Board: Element or component of a pallet deck oriented perpendicularly to the stringer or stringer boards. 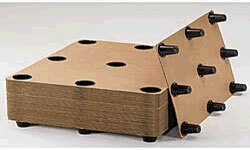 Deflection: The amount of deformation or bending in a pallet or pallet component under load. Double-Face Pallet: A pallet with both a top and bottom deck. Double-Wing Pallet: A pallet with top and bottom deck boards extending beyond the edges of the stringers or stringer boards. Eight-way: A pallet that permits forklift entry on all four sides as well as diagonally at each corner. EURO Pallet: A block style pallet measuring 1200 mm x 800 mm and built to European Pallet Association specifications. Only pallets built and branded with an Association logo are considered authentic EURO pallets. Exchange Pallet: A pallet intended for use among a designated group of shippers and consignees where ownership of the pallet is transferred along with the ownership of the unit load; also known as a common pool pallet. Flush Pallet: A pallet with deck boards flush with the stringers, stringer boards or blocks along the sides of the pallet. Fork Entry: Opening between decks, beneath the top deck or beneath the stringer notch to admit the tines of a fork truck. Four-Way Block Pallet: A pallet with openings at both pallet ends and along pallet sides sufficient to admit hand-pallet jacks or forklift tines; also called the full four-way entry pallet. One positive aspect of this pallet is that no matter how the pallet is oriented in storage or stowage, it can be easily maneuvered with a mechanical handling device. Free Span: The distance between supports in a warehouse rack system. Hardwood: Wood from broad-leaved species of trees. This does not necessarily mean that the wood from these trees is hard or dense. Length: Refers to the stringer or stringer board, in block pallets; this also is typically the first dimension given to describe a pallet. For example, in a 48 x 40- inch pallet, the length of the pallet stringer is 48 inches. Life to First Repair: This is equivalent to the number of trips a pallet will make before requiring repair. Load Bearing Surface: Actual area of material in contact with and supporting a unit load. Multiple Use Pallet: A pallet designed to make multiple trips under different conditions. Non-Reversible Pallet: A pallet with a bottom deck board configuration different from the top deck. This type of pallet cannot be used when turned upside down, either because it has no bottom boards or because it has a limited number of them. Notch: A cutout in the lower portion of the stringer to allow entry for the forklift tine. Notched Stringer: A stringer with two notches spaced for forklift tine entry. One-way Pallet: an expendable pallet usually made of low-quality materials intended to be shipped once and then disposed of. Overhang: The distance the deck extends from the outer edge of the stringer or stringer board or the term can also refer to the distance the unit load extends beyond the footprint of the pallet deck. When this occurs the goods are susceptible to damage due to potential contact with adjacent cargo and/or structural members of a storage facility or transport conveyance. Pallet: A portable, horizontal, rigid platform used as a base for assembling, storing, stacking, handling and transporting goods as a unit load. Pallets are traditionally fabricated of wood but we are now seeing use of plastics and even metals in the construction. Pallet Design System: Reliability-based and computer-aided design program for determining the safe load carrying capacity, performance and economy of pallets. Pallet Jack: Hand-propelled wheeled platform equipped with a lifting device for palletized unit loads. Pallet Life: The period during which the pallet remains useful, expressed in the number of units or one-way trips it can handle during its life expectancy. Partial Four-Way Stringer Pallet: A pallet with notched stringers. Recycled Pallet: A pallet that has been repaired for re-use; also called a refurbished or reconditioned pallet. Remanufactured Pallet: A pallet built from either all reclaimed (used) lumber or built from a combination of new and reclaimed lumber. Reversible: A pallet that has deck boards spaced identically on top and bottom; permitting the pallet to be reversed. Shipping Pallet: A pallet designed to be used for a single one-way trip from the shipper to the consignee. It is then disposed of. Single-Wing Pallet: A pallet with the top deck boards extending beyond the edges of the stringers or stringer boards with the bottom deck boards flush. Skid: Used interchangeably with pallet but actually a skid is a pallet without a bottom deck. Also called a "single deck" pallet. Softwood: Wood from a coniferous or needle-bearing tree. Solid Deck Pallet: A pallet constructed with no spacing between the deck boards. Span: The distance between stringer and block supports. Strap Slot: Recess or cutout on the upper edge of the stringer or the bottom of the top deck board to allow tie-down of a unit load to the pallet deck with straps/bands; also called the banding notch. Strapping: Flat metal or plastic bands that are used to secure the load to the pallet. Stringer: Continuous, longitudinal, solid or notched beam component of the pallet used to support deck components, often identified by location as the outside or center. Top-Deck of the Pallet: The assembly of deck boards comprising the upper load-carrying surface of the pallet. Trip: A measure equivalent to 4-6 handlings of a pallet. 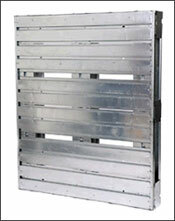 Two-Way Entry Pallet: A pallet with unnotched solid stringers allowing entry only from the opposite ends. This does not provide a great deal of flexibility for cargo handlers. Unit Load: Assembly of goods on a pallet for handling, moving, storing and stacking as a single item. Warehouse Pallet: A double-face, multiple trip returnable pallet intended for warehouse use. FM Property Loss Prevention Data Sheets 8-24 "Idle Pallet Storage"
ISO Standard 6780:2003- "Flat Pallets for International Materials Handling"
NFPA 13 "Standard for the Installation of Sprinkler Systems"
Pallets 101: Industry Overview and Wood, Plastic, Paper and Metal Options by John W. Clarke. Grate Pallet, Inc.